Comptroller Scott Stringer's office sent an email to Mayor Bill de Blasio's team on May 2 with concerns about the handling of nearly a billion dollars in retiree benefits in the new UFT labor deal. The mayor's office says it didn't hear about the concern until May 9. CIVIC CENTER — Comptroller Scott Stringer’s office privately raised concerns about Mayor Bill de Blasio's first budget nearly a week before it was released, worried the mayor was putting off paying for the recently inked teachers' contract, DNAinfo New York has learned. Stringer was concerned about de Blasio's plan to spread the $725 million in retroactive pay for United Federation of Teachers retirees over four years, rather than paying the retirees entirely in the current year's budget. 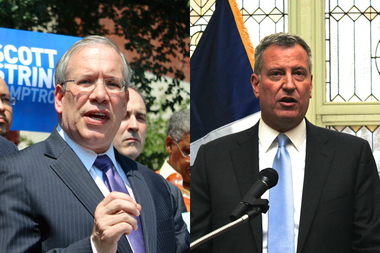 Stringer believed de Blasio was violating standard city accounting practices. The mayor's office said the first time Stringer's office raised the concerns was on May 9, a day after the executive budget was released. But an email obtained by DNAinfo New York shows a top comptroller's office aide reaching out to a senior official at the mayor’s Office of Management and Budget on May 2, requesting details on how the administration was planning to handle the payments to retirees, among other issues. According to a source with knowledge of the situation, the two offices discussed the timing of the retiree payments after the May 2 email, but did not resolve their differences before de Blasio released his budget. On May 9, Stringer and de Blasio met at Gracie Mansion to try to come to an agreement face to face, and discussions continued through that weekend, according to a source. On Monday, May 12, Stringer and de Blasio announced the city would follow the comptrollers' recommendation, and put all the retroactive retiree pay in this year's budget. “This adjustment has no impact on the total cost of the agreement since the majority of these expenses were already shown in the plan, but it does affect the timing of the booking of these expenses,” de Blasio and Stringer said as part of a joint statement on Monday.